Academic Admins and Registrars have nearly-comprehensive access to courses—about the only thing you can't do is grade tests. This extends to both active and finalized courses. Faculty and Teaching Assistants can modify content, progress, tests, assignments, etc. as well as finalize the course; they are the only users who can grade tests. Students can read any of this information, as well as interact with assignments, tests, and lessons. Most of what's in the Info view is drawn straight from the Course Catalog. Except for the term and course fields, you are free to modify any of this information by clicking the field name and making your edits. Next to Student Access, select Custom. Enter the date(s) you wish students to be able to access course materials and interact with them. You can enter a date in one field, the other, or both. Meeting Times let you schedule the course; if you do not enter anything here, faculty will not be able to take attendance! Cloning copies content—lessons, discussions, assignments, etc.—from other courses. Check off the items you wish to clone. You can select different elements from different courses—say, the assignments from one and the tests from another—just repeat the cloning process for each course you're cloning from. If you clone the same type of content from different courses, Populi only keeps the most recent cloned content. If you clone the tests from ENG101 and then the tests from ENG102, the tests from ENG102 will overwrite the tests from ENG101! You can only clone discussions added by the From course's faculty. To clone tests, you must also clone assignments. This will also clone all of the From course's test questions. Select the specific course instance from which you wish to clone the content. You can also clone from different catalog courses. Begin typing a course name or abbreviation and select from the results. Once you've cloned course content, you can still modify it as needed. If you have exported materials from another LMS in Common Cartridge format, you can import that Common Cartridge file into your course. The Common Cartridge importer works only when you upload the entire .zip file you exported from the other LMS. Make sure that you have that original .zip file before you try to import these materials into Populi! Choose a file: locate the .zip file on your computer and upload it. The filename should look something like this example: Thermodynamics-CC-ENG.zip. Select records: Check the assignments, Discussions, Links, Lessons, and Tests you wish to import. Import selected records: You can also cancel. After you import, click the link to go back to what you were doing. Finalize course submits the grades to the registrar and closes the course to further modification, assignment submission, etc. Typically, finalizing a course falls to the course faculty. Registars will more likely use the Unfinalize function to make some after-the-fact change or correction. Here’s how to finalize a student or the entire course. On the Info, Gradebook, or Final Grade page, click Finalize course (it may also say Manage finalization). On the Manage Finalization page, check the students you wish to finalize. You can also check at the bottom to finalize the course and all students. When you finalize a student: The student's grades are submitted to his permanent academic record, updating his transcript, grade report, and statistics (earned credits, GPA, etc.). It also closes him out of the course, so he can no longer submit assignments, take tests, and so on. When you finalize the course: The course is closed down to all activity and updates—no one can now add assignments, change settings, and so forth. Go to the Manage Finalization page. 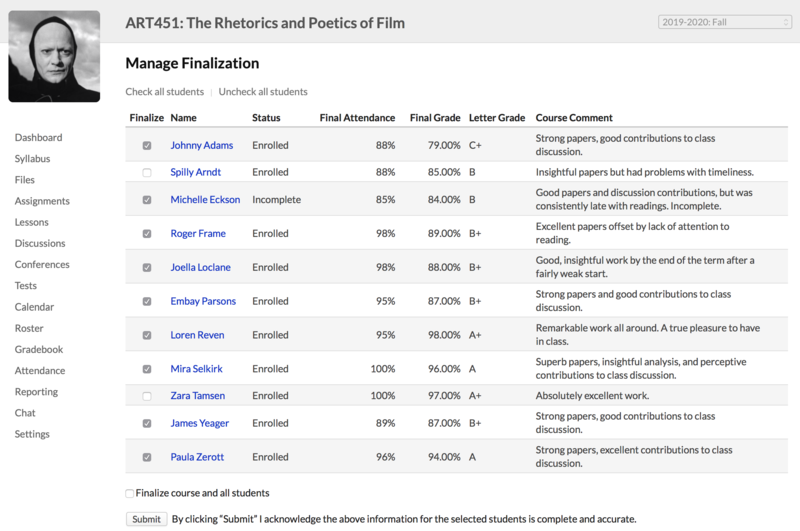 Uncheck Finalize course and all students at the bottom of the screen. If you need to unfinalize particular students, uncheck their names. Now that you've unfinalized the course (and students, if any), you are free to update their records. Make sure to finalize it again as soon as possible—unfinalizing a course affects historic records for all of that course's enrolled students (not to mention reporting, term stats, etc.). It appears that Faculty get the 'Unfinalize course' option from the gear menu in a finalized course. It gives them the confirmation dialog, and then refreshes the page without doing anything. We were quite concerned for a minute that any faculty could unfinalize a course, but that doesn't seem to be the case. Is it intended to have that option even show up for anyone without the Registrar role? We just fixed that up—now only Academic Admins and Registrars can see the option to unfinalize. Thanks for catching that for us! I would like to clone course schedules from one semester to another.